Sterling Silver. This heavy celtic cross shows the trinity knots. Made in Ireland. 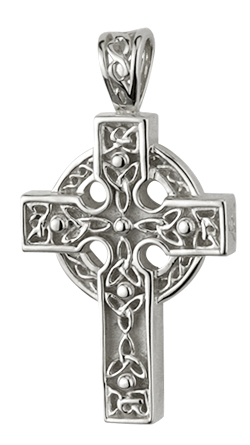 This classic celtic cross shows the Claddagh symbol. The hands represent Friendship, the heart Love and the crown Loyalty. what length and weightis the chain included with the cross S4795, please ? The chain is a 50cm long chain. It is a light snake chain.